My 5 1/2 year old boy absolutely loves the McGriddles from McDonald’s. He literally begs for them and will eat two at a time when he gets the chance. I HAD to make a more healthy version of this that I could feel good about him eating. And then my 16 year old daughter said, “MOM LET’S CALL THEM MCCRIDDLES!! !” HAHAHA! Perfection! So I present to you the McCriddle. I tried the pancake several ways but came up with this as the best option. Also, it is dairy free and grain free and of course, sugar free, low carb and TRIM HEALTHY MAMA friendly!! You can use Turkey or Pork sausage, whatever your preference. I like to put a swirl of syrup in the batter as it is cooking on the griddle and then flip. These freeze well! Just make ahead, freeze in baggies or wrap well, take out and pop in microwave for 1 minute. Drizzle the syrup over the top when ready to eat. **NOTE- the pancakes need to cook longer than usual to get a good crust on the top to hold together well. I didn’t time the amount but it was at least 3 minutes a side. Mrs. Criddle’s low carb version of the McGriddles. 1– 16 oz tube of Turkey or Pork Sausage cut into six to eight patties and cooked… you might have extra patties, we have a couple patties. **Optional- you can use 1/2 tsp of maple flavoring to give it more of a maple flavor. **Optional- if you feel like the batter needs a little binding, you can add 1/2 tsp of Psyllium husk flakes at the very end. 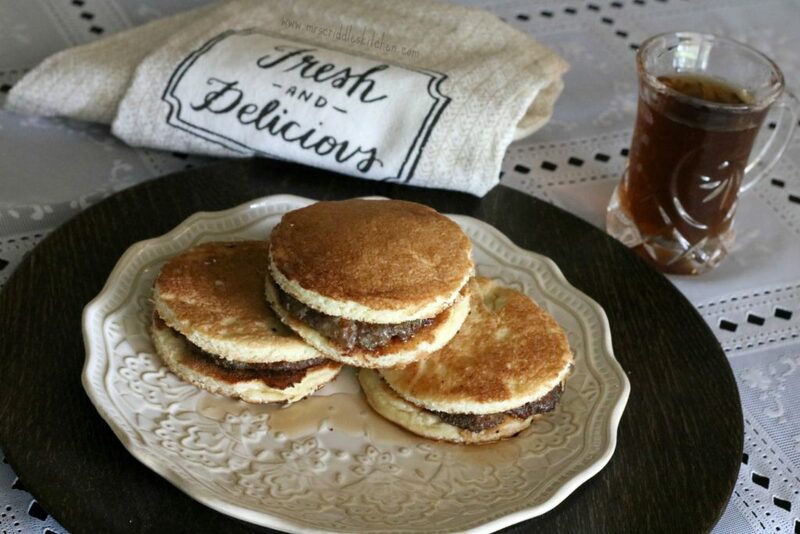 Sugar free syrup to drizzle over sausage patties and in the batter as cooking. Slice the patties & pat into round circles. Heat griddle at 400 degrees or put a big non stick skillet on medium high heat. Mix together the flours (please remember to just scoop gently and shake. You do not want to pack in the flours or it changes the batter consistency. ), baking powder, sweetener and salt. Add in the 2 whole eggs, cashew or almond milk and mix. Whisk eggs whites until you get a stiff peak. Gently fold in the egg whites until incorporated. Once incorporated, spray griddle with coconut oil or butter. Scoop out about 1 1/2 tbsp. 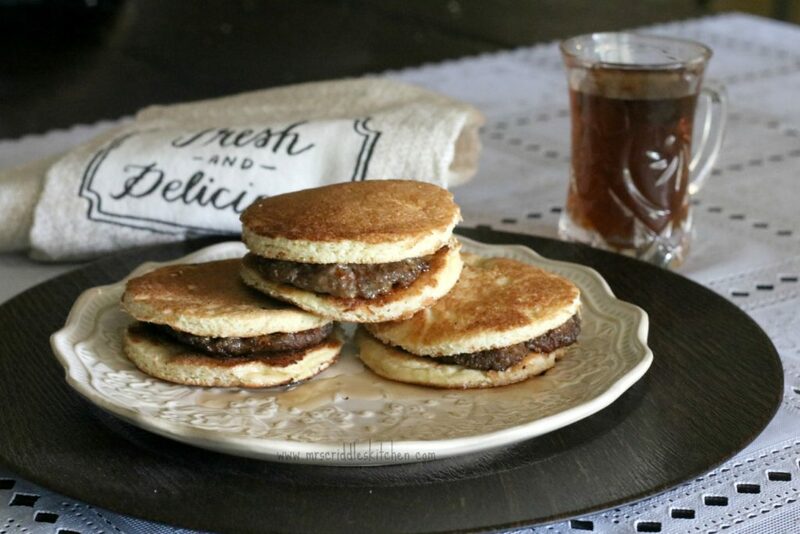 of batter and use a spoon to make in a circle large enough for your patty. As the top cooks, drizzle a little syrup into the raw batter on the griddle. Slide a non-stick spatula under the pancake QUICKLY. Flip and cook the other side. Do this until you have used the batter up. 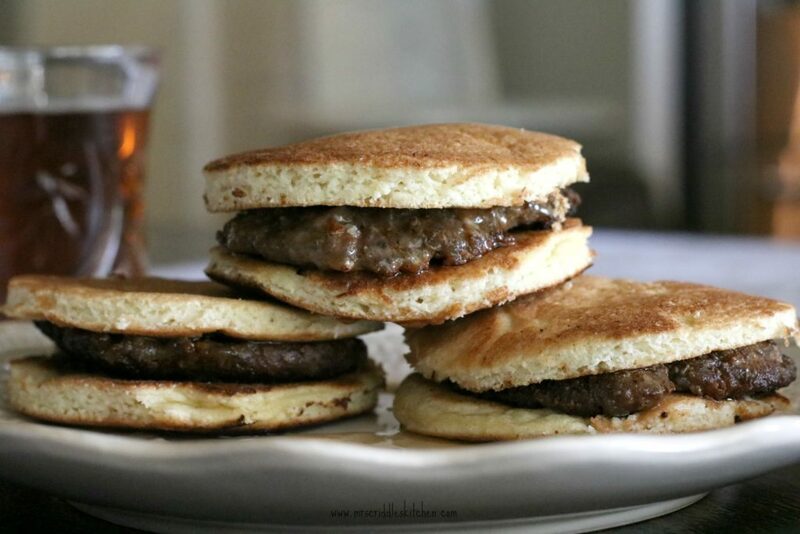 Take two pancakes, place a sausage in between and drizzle pancake syrup over the sausage. **Optional- you can cook up and egg to add to this. ***NOTE- these do freeze well. If you are making ahead to freeze, do not put the syrup on. Wrap well or place in freezer baggies. Take out and heat up for 1 minute. I can’t wait to try these!!! P.S. It is SO awesome that you include the sweetener conversions in your recipe!! Think it would work with the THM baking blend instead of the almond and coconut flours? I’m super new at this, so I’m not sure how substitutions work. 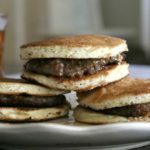 🙂 My 6 year old loves the McGriddles, too, so I’m so thankful for this recipe! Hey Ashley… I actually tried the THM Baking Blend first. I didn’t care for the flavor of it… but you are welcome to try it. Just replace flours with 1 cup of THM Baking Blend. So that would be 1 cup baking blend (to the 1/2&1/4 called for) novice cook here . Yes but it didn’t turn out the best using baking blend. I did try that first. What Can I sub for the psyllium husk powder? You can leave it out. I made a couple without it. It just helped keep the batter together. FANtastic! Can’t wait to try them! Thanks!! I’m really looking forward to trying these. They are freezer-friendly, correct? Thank you!!! I’m so excited to try this. And I agree with Kari above about giving us the sweetener conversions. Thanks again!! Do you use the vanilla AND the maple flavoring? Thank you! You can… I only used vanilla though. I haven’t had McDonald’s in over three years now. My two favorite things were Big Macs and McGriddles! Oh man they were so good! SO I had to try this! It’s really good! I don’t have any kids at home anymore so I froze them for future breakfasts! Thanks! So how did your 5 1/2 year old rate these compared to the McDonald’s ones he loves? I can’t wait to try these. Well… he thinks they taste just like the McGriddles (his words this morn). I’m just happy he thinks so!! Hoping to buy sausage tomorrow to try them. I always liked the McGriddles. Haven’t had one in years. You are officially my new favorite person! Thank you so much! These are fantastic!!!!! Just fixed this for breakfast. So, so good. Thanks for recipe!! This is awesome! A savory breakfast I would totally eat! My husband sent me the link to these so I made some for a skiing trip that he and my son were going on. They raves about these. I’m currently making another batch for them to have for the week. My husband likes to put a fried egg on top. With his coffee and a piece of fruit he only needs one of these. Thanks so much for sharing this with us! What kind of sugar free syrup are you using? I’m finding aspartame in all the sugar free varieties. I like to make mine from the THM cookbook or I use the Logcabin kind. It doesn’t have the best ingredients in it but it is sugarfree. What do you consider a serving? What is considered a serving? How many pancakes with sausage are we allowed? Look yummy!! At LEAST two or three! Whatever makes your full really! These were absolutely delicious. I didn’t even do the extra syrup in the sausage, pancakes, or afterwards. I added maple and vanilla extract to the pancakes. Huge hit with the hubby and the kids. Beating the egg whites was exactly the step I’d been missing to getting a light and fluffy grain free pancake. Loved them! My husband hate coconut flour…. he loves these!!! Only thing I changed is the vanilla flavor and put maple instead and I didn’t need the sugar free syrup because they were awesome without!! Another great recipe! These were fun and delicious. Great substitute for the original unhealthy version. I used a wide mouth mason jar ring to shape my batter on the griddle. Do you whip up the egg white before folding into the batter? Do carton egg whites not work well with this recipe? yes, I whip up the egg whites before. Fresh eggs work best. I don’t know if egg cartons will work. I am not seeing in the directions to whip the egg whites prior to adding them. Thank you! I corrected that! I made these this morning. A BIG hit here!! Thank you for the recipe! I subbed bacon for the sausage and added a fried egg. I need recipes that freeze for days when my husband and I both work. This will be added to our THM favorites list. So can I assemble and freeze together w the sausage & micro whole sandwich for 1 min or do I have to do separate ? They are sooooo good! Thank you! Yes that is what I do! Since these are already an S meal, could I use butter in place of coconut spray? Or would that tip the scale too far?